Fort Leavenworth was established on May 8, 1827, by Colonel Henry Leavenworth and 188 officers and men of the 3rd Infantry Regiment who traveled by keelboat up the Missouri River from Jefferson Barracks at St. Louis. Leavenworth was ordered by the War Dept. to establish a cantonment to protect the wagon trains headed west along the Santa Fe Trail, and later, the Oregon Trail, and to help maintain peace with the Indians. According to a treaty with the Indians, the cantonment was to be located on the east bank of the Missouri River. Colonel Leavenworth noted that the east bank was low and marshy, so he chose to build the cantonment atop the high bluffs on the west bank. The War Dept. later approved his decision, and the establishment was officially named Cantonment Leavenworth. "Cantonments" were redesignated "forts" in 1832. In the 1830s, the fort was the starting point for exploring parties. The U.S. Regiment of Dragoons conducted expeditions each year through the Great Plains in an effort to keep peace between the Indians and ensure the safety of the wagon trains heading West. During the Mexican War, 1846-1848, Fort Leavenworth was a major base of operations against Mexico. It was here that the Army of the West was assembled under the command of Gen. Stephen Watts Kearney. Fort Leavenworth became not just a Headquarters, but also the major supply depot and center for military overland freight supplying most of the forts throughout the West. The Kansas-Nebraska Act of 1854 changed the earlier treaties with the Indians by opening this area to white settlement. Because of this, Fort Leavenworth's peacekeeping mission was greatly complicated. Now the Army had to try to protect the new settlers from the Indians and to keep peace among the settlers. During the era of Bleeding Kansas, the first blood of the Civil War was spilled in Kansas Territory over the slavery versus free state issue. 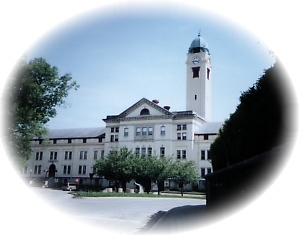 During the Civil War, Fort Leavenworth was a receiving and training center for recruits. The war came closer in October 1864, when Confederate Forces under Gen. Sterling Price moved toward Fort Leavenworth. Some of the Federal Forces who defeated him at the Battle of Westport, outside Kansas City, came from Fort Leavenworth. In 1864, because of continuing Indian unrest, authority was granted for recruiting Confederate Prisoners of war to serve with the Army. They were known as "The Galvanized Yankees." Some 5,000 volunteered, under the condition they were used only against the Indians and not their former comrades. In 1865, Fort Leavenworth served as a staging area for these soldiers. This major historical site has seen many firsts. It was the first permanent fort established west of the Mississippi River; the first continuously occupied settlement in Kansas; in 1834, the post became the first permanent home for the entire 1st Dragoon Regiment, the first regiment of U.S. Cavalry; Major Riley the post commander, was the first to use oxen to haul wagons over long distances which set the pattern for westward migration. The oldest house in Kansas is on the post. These beautiful artifacts of bygone wars remain a mystery at Fort Leavenworth. They were cast in the 1700s in Paris; the name of the foundryman and place and date of manufacture are on each piece. How or why they came to Leavenworth is unknown. Built in 1878 by prison labor from stone quarried on the post and, today, is considered to be an outstanding architectural "gem" in this area. Headquarters area buildings are named for Generals Sherman, Grant, and Sheridan. They were built from 1859 to 1904 and are on the site of the former soldiers burying ground. The School of Application for Cavalry and Infantry, established in 1881. Sculpted by Loredo Taft, in 1889, the statue and the pedestal are 9 feet tall each. It was the largest statue of its type in the Midwest when it was installed.